I took the photo posted above, click for larger, this past Saturday morning. 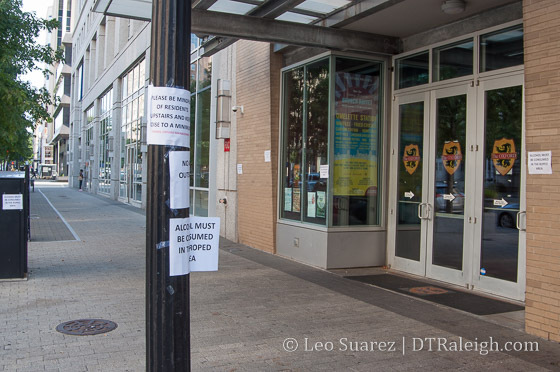 I was out for a walk and Fayetteville Street is littered with these cheaply printed signs that say, “No Alcohol Beyond This Point.” How many can you count in that photo? I was irate recently to see that the new ordinance forced businesses to consolidate their seating against the building. Ugliness resulted. Sidewalks were completely blocked but was fortunately only short-lived as the split seating seems to be allowed once again. I hope so anyway. This issue has been frustrating from so many angles. What hasn’t been talked about is the clear bias being shown here on this issue. Emotions are running high and decisions are being made in haste because of it. A recent N&O article asks, “Does downtown Raleigh have a drinking problem?” There’s so much exaggeration and bias going on here that it makes me face palm. The tone of the conversations suggest that we’ve peaked, that we have too many bars, that the nightlife crowd is out of control. This may or may not be true but that doesn’t matter from my point of view. Emotions are leading the decision making process and that is not going to go well. Thoughts like, “Why would anyone be out that late?” or “Everyone should be sleeping at night.” is what it really sounds like. It’s a bias against people that partake in downtown’s unique nightlife, something nowhere in the Triangle comes close to matching. Isn’t the city supposed to be an inclusive city, a true character trait of a 21st century city? It seems that everyone is cherry picking the few bad apples. I’m talking about those that vomit after drinking too much or trashing our sidewalks. If you have traveled, it should be pretty clear that humanity is like this and it can be handled in two ways. Crack down on it or embrace it. We’re currently trying to crack down on it, a tactic I think we should avoid. To embrace it would be to own the problem and just handle it. Where is the Downtown Raleigh Alliance, with their ambassadors and street cleaners, in this? They own street cleaners and have ambassadors that pick up trash. Is someone slacking on the job here? I’d also love to talk to law enforcement. I bet enforcing the new ordinance is going to be quite the hassle with restrictions like “one person per 15 square feet.” I’m sure they will have plenty of feedback to provide once the three-month trial is over. My spidey-sense just goes off on this one because how could so few, create so much change? The city said it received 51 complaints about downtown nightlife between June 2 and July 30. A dozen of them were filed by police or city staff, and 15 came from three people. *Does downtown Raleigh have a drinking problem? via N&O. That’s 51 complaints across 58 days. Who were those three people? What kind of pull do they have? I haven’t seen the data but I’m going to go out on a limb that they were mainly clustered around Friday and Saturday nights. A different way to look at it is that there were 51 complaints across 8 weekends, or 7 complaints per weekend. It just doesn’t add up to me. And shouldn’t Raleighites across the city, all the way up to Brier Creek, be upset about this? In the early 2000s, it was the entire city that paid for the Fayetteville Street makeover, taking the old Fayetteville Street Mall and making it a fancy parking lot. Business boomed as you can see. Why should so few have the say over what happens on our city’s Main Street? It’s all ugly. The process of handling this “problem” as well as the ugly signs all over the sidewalks. It doesn’t show class. It doesn’t show style. We’ve practically demoted ourselves from a burgeoning medium-sized city to a bustling college town. Maybe we’ve outgrown the current class of downtown leaders. It’s kind of hard for me to believe that this is an issue. Raleigh pumped a ton of $ into downtown to grow the area, increase the amount of people that live downtown, businesses that are located downtown and ultimately the $ generated due to having a busier downtown. Then when a problem arises, the solution is to attempt to curtail the issue by imposing an ordinance that makes the streets uglier, favors the position of a small minority over the vast majority and negatively impacts all of the businesses it sought to attract to the area in the first place. The people complaining about the noise should have never moved downtown, I don’t understand the logic in moving somewhere that will inherently have a busier nightlife than elsewhere and then complaining about that fact. Hire more street cleaners, ask other cities how they’ve addressed the problem, etc. But the current way that they’re attempting to deal with this problem is absolutely insane. If you want a quite, pastoral way of life may I suggest you live in the country. I do and it’s quite lovely. I mean the point of living downtown is to be close to all the action. You can’t have it both ways, but that seems to be what they’re trying to achieve. Maybe we can setup the downtown area as a gated community. Close the gates after sundown and if you don’t live there you stay away. I hear Brier Creek and North Hills is nice. The unfortunate thing is this nonsense is starting to give a self-inflicted black eye to the rise of Raleigh’s national prominence and reputation. I don’t fault people who complained. Good for them to try to work the system. But the reactive policy that the city generated doesn’t even make sense. If noise is the issue, why don’t they try to address the noise? If people walking in the street is the issue, then try to enforce that. 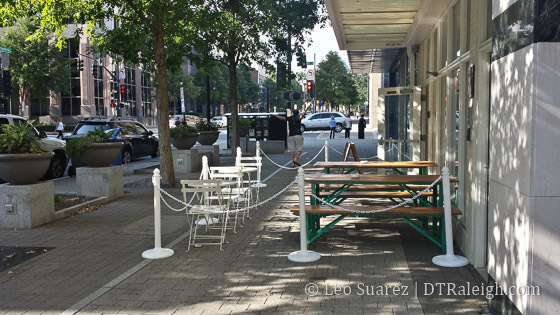 They randomly correlated all the problems to sidewalk patios without any evidence or reason. So what we end up with is these confusing and random rules that don’t actually solve a problem. Define the problem and then try to address that very specifically. But really, when you define the problem is when you learn that 7 people complaining is not really a city-wide problem and this was all a hasty overreaction. This “experiment” will prove to be one of the lowest points for the city leaders and will most definitely backfire. The problem is, it will be too late when several downtown establishments lose their clientele. City leaders need to remember that the type of businesses that will be hurt the most are the ones that pay additional funds to keep things going around Fayetteville Street. As Will suggested, if there is a problem that we need to curb, let’s look at how other cities dealt with it, assuming they were successful, of course. Totally agree that the city made the wrong choice, but I also think its a horrible idea to create a business plan that relies on City property for it to survive. I also am tired of hearing about save the patios, when its let me use the sidewalks. The city needs to either have the bars clean up the mess or hire staff to do that. Research how other cities do things. Welcome to America. It seems lately that minority(and I’m not referring to race) voices get more say than the majority that is happy with the way things are. Why do 2% of the population get to complain to 98% of the population and get their way? At some point in time our leaders have to stand up for what the majority wants. Next, if trash and filth is such a big deal on Saturday nights, then why don’t we just figure out a way to make the late night establishments(those profiting) pay a small clean up fee, tax, etc? Why does it have to come to ropes, rails, and other things that make the Monday- Friday business crowd suffer when we are walking to lunch or wherever? I work and exercise downtown so I agree that these retainers crowd the sidewalks. Terrible!!! Could someone please provide me with an email address where I can contact the city. I live next to the 440 belt-line and I dislike the noise that all these obnoxious cars make 24 hours a day. I was not informed before moving in that this would be the case, and it has become “unlivable”. I hear car horns, motorcycles, and Semi-trucks with their exhaust brakes. I would like to propose and new “highway-ordinance” that would limit the amount of driving on this highway from the hours of 1 until 6 so I will be able sleep in peace. The issue with the Fayetville Street ‘establishments’ is the same issue Glenwood South experienced, too high of a concentration of ‘college/post college’ bars. The result is a bunch of drunk 20-30-somethings, drinking, puking, screaming in the middle of the street, not to mention the fact that these bars seem to think they can take over public space (at no cost) and completely block the streets. Raleigh does NOT want or need this single-purpose type of establishment dominating the Capital’s Main Street. and NO, this does not mean the City wants to reign in the dynamic growth the City has experienced over the last decade. It just means we need a balance and Common 414, Anchor Bar, PaddyOBeers, and whatever other “let’s get drunk and raise hell” bars littering the street is not a proper balance. I think uncle jesse gets to the real question about downtown. The word vibrant gets thrown around a lot. I would argue that downtown is not vibrant, it has become a monoculture of bars/restaurants. The street level experience is not diverse or dynamic, and I think that is in part because the easy money for property owners (via rent) and business owners is in alcohol sales. We shouldn’t have lights out storefronts in the daytime on the most pedestrian trafficked street in the city, but we do. The solution proposed may not be the way to solve this, and the rollout was certainly handled poorly, but I do think a broader discussion about what we want out of our significant investment in downtown is warranted. I, for one, was hoping for more than another Glenwood South. I want to start this comment with ‘I am against the patio ordinance.’ I think it’s accomplishing nothing, losing local businesses some money and creating a divide in the relationship bw business owners and the city. Ok, with that said, Uncle Jesse is right on point with what Raleigh is doing. They aren’t just throwing out some ordinance b/c a few people complained. They are worried that the only spot available for the business/retail district that they want and need so badly is being overrun by party bars and this gives them the crack of the door they were looking for to try to do something about it. It’s actually something (IMO) that really needs to have some discussion around. If DT Raleigh wants to be taken seriously by big time companies willing to spend big time dollars then they can’t have a main street filled with party bars that don’t provide anything to the community during the morning or afternoon hours. But can the city really say that these bars have to shut their doors? No way. So instead they tried this ordinance that you can’t have patios if you dont serve food. Then those bars fought back and the people spoke, and now you have some dumb hybrid of the initial proposal that makes sense for NOBODY and doesn’t even accomplish what the council was likely trying to do. Instead of just hurting these party bars, they are now hurting the very businesses that helped Fayetteville St. grow from the beginning. Im not sure what the answer is, but there has to be a discussion about it and the residents of DT Raleigh need to be involved in that discussion. But the council needs to be transparent about what they are trying to do and what problems they honestly need to solve…. Who is going to be that catalyst to start these tough conversations? We’re looking at you Matt Tomasulo, Ashton Smith, and Mary Ann Baldwin. Have you ever been to Paddy O’Beers or Common 414??? One is a craft beer store with very little noise and zero “getting drunk and raising hell” as “Uncle Jesse” proclaims and the other is a nicer cocktail lounge with NO sidewalk seating whatsoever. How about before you start slamming people’s businesses you actually go check them out. You may actually like them! I tried to stop by some of these establishments but the entire sidewalk was blocked with the Red Bull ‘annex’ to these same bars……kindly paid for by taxpayers. Oh. That’s right. Restaurants don’t pay taxes. And if you knew ANYTHING at all about downtown those outside bars have been made illegal except for when Raleigh Times closes off their entire street and sells booze in the street. Thanks for your input “Jesse” aka Hatems hero. On a related (unrelated) note, are there any plans to improve the streetscaping on Glenwood South? Had a chance to visit the Beer Garden (which was good fun), but I was reminded that the sidewalks are far too narrow for the crowds on that street at night. I do agree with the fact that Fayetteville St. has become too full with the same type of bars. I’d love to see something like Ale House or Hibernian on Fayetteville – something that offers more to patrons all day – rather than primarily being places that do their business between 11 pm & 2 am. 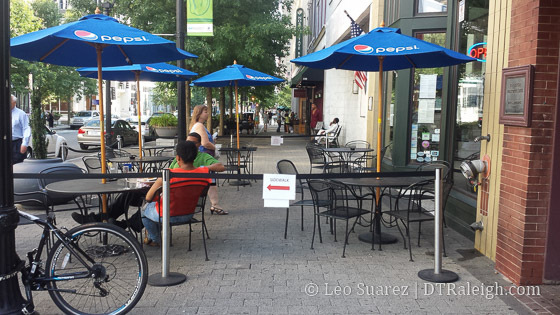 Nobody was complaining when Raleigh Times was the only sidewalk restaurant & bar. Its only when the cheeseball bars opened up and down Fayetteville Street did any issues arise. Ever ask yourself why that is the case? I love that Glenwood South is being called out here as an example of what not to be. 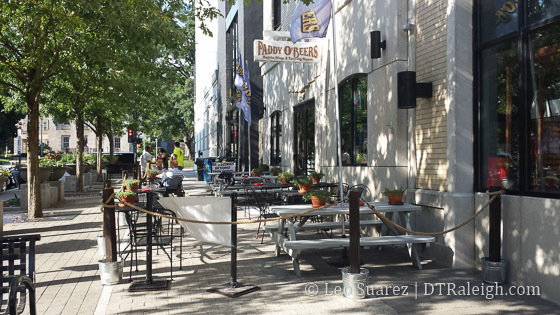 Did everyone miss the creation of the Glenwood South Hospitality District where GS businesses and residents came together to agree on a solution to noise issues? Where the first tactic was residents and business owners communicating more? Where the noise complaints have decreased dramatically since then without silly ordinances? Maybe the purchase and rental prices are a bit higher on Fayetteville St (but not by much, if at all) but that doesn’t mean similar solutions wont work. Stop calling out GS as if it’s the Jersey Shore of Raleigh and actually visit once in a while instead of relying only on what you’ve heard, read or experienced 5+ years ago. I’ve enjoyed downtown Raleigh. I love going out, hanging out, dancing. But I want Raleigh to be a full-spectrum city, good for all ages, orientations, and races, and I think that’s what the City Council is trying to keep. I agree people are getting emotional about it, and I don’t understand that part. The owners and employees, I can understand, this is money out of their pockets, but everyone else? I do not understand why people so passionately want to keep drinking outside until 2am. So, any new construction taking place? It appears from reading the previous comments that there is a difference of opinions on downtown….. I have been working downtown Raleigh for over 13 years and I have seen how it was before and how it has changed to the way it is now. Believe me that it is much much better now. Wishing for things to be different or that there should be more retail etc…. is a waste of time. Until downtown Raleigh reaches a critical mass of workers and/or residents then the type of businesses that are downtown will not change. Nobody wants to build a grocery store, movie theater, or retail stores that they fear will not stay in business very long. Give it time for downtown Raleigh to catch up and it will happen in time. But for right now the only businesses that are sure to make money are the bars and clubs because young people are willing to come downtown to play. Ah, I just googled “Kane Downtown Raleigh” and what do you know? There is a story! The city has approved Kane’s project. The story says it will take Kane 6 months to finalize and 18 months to build. So he gets started between Sprin and Summer of 16′. 17 story building coming to the warehouse district! First tall building in the warehouse district. Huge! Released in the last 20 hours. Extra Extra… Read all about it! Time to get these projects going! This reminds me of my neighbors that moved in next to me at 222 glenwood and complain about noise. Why the hell would you move downtown if you don’t want noise and want peace and quiet. BTW the noise people make outside is nothing to that God D*mn train that runs along glenwood blaring its horn long and slowly every 10 feet at all hours of the night and morning. I call for a train ordinance! TC, what time does that train roll by each day? I’m sure by now, you have a good idea of the times that it rolls through every time. Lived in the Quorum long enough to know its 11:30 PM and 6:30 AM for train. Unbearable, especially since the way I understand it the city could upgrade the crossing mechanisms so that the blaring horn wouldn’t be a requirement. Downtown, Saturday night around 1 am…. Curbside parking is allowed, so Fayetteville st is lined with parked cars taking up a lane that could be designated for drop offs / pick ups only. Taxis and the idiot uber drivers have to stop in the street and back up traffic (sometimes up on Morgan) because it takes 4 minutes for wolfpack drew and his broski’s to get their drunk asses in the damn car! The traffic situation seems to irritate some of the cabbies from the motherland, because these are the guys I see honking and yelling out the window at each other the most. Those new “NO LEFT TURN” signs might as well be invisible. The most active stretch is between Hargett and Martin. Crowds of drunks on both sides of the street. People dart out in the street from between parked cars without looking. Sometimes fights break out. If your lucky you might get flashed. Some of the young women can be very naive. Strangely, not much puking. Tons of stumbling around and general drunkeness though. Police are on the scene, but are very tolerant. (I have seen dudes get their heads bashed in at walnut creek and pnc by rpd for less offensive behavior). The hotdog vendors and the saxophone guy are out doing their thing. Always a group or two preaching their religion to an unattentive audience. Some of the rickshaw guys weave around like it’s an obstacle course. That stupid trolley pub gets treated like a roller coaster. By 2:30 there will be an incident over by Mirage. North West st will be barricaded by police cruisers with lights and sirens blaring, cops on segways with gopro helmets and flashlights corralling the bystanders away, paddywagons on the scene, a young black male or two or ten in handcuffs, crowds of people cussing at police. Quite the sight to see. I can see how some could find it all annoying but I love it and am out every weekend just enjoying the streetscape. We live in a prosperous area, full of universities and young people with expendable incomes who like the nightlife. The sidewalk ordinance will not last. Taller buildings will be built. Prices will rise and traffic will get worse. Raleigh 2030 will be as cosmopolitan as any other city of similar or larger size. Durham as well, if not more! I lived downtown for a year off of Peace Street. The loudest thing I heard was Broughton HS and the never ceasing gym whistle from morning gym to afternoon practice. The PA game announcer was excessively loud and as every game progressed they turn it up so it becomes annoying low background noise to by half-time louder than your tv can go. Since there’s only a few games a year I lived with it, but I always wished the whistle noise could stop. That is all year as each new sport takes the field for practice after school. I’m sure there’s plenty of noise from the bar crowd, but it never was louder than my tv or forced upon me in such a way that I felt compelled to leave my home for quiet as Broughton HS did during football season. I can’t complain about marching band practice bevause although loud I kind of enjoyed listening to them practice, it was the choice in music I found questionable. I have heard Beyonce’s Crazy In Love more than her producer I think! If we had more parklets some of them could be puke parklets, or pukelets.